Cryptoindex is making waves by creating a platform that is on par, or even better than the standard indices that are currently available for conventional financial assets. We asked VJ Angelo, the company’s CEO to get a clear picture of their vision and what they are attempting to achieve by attaining that vision. 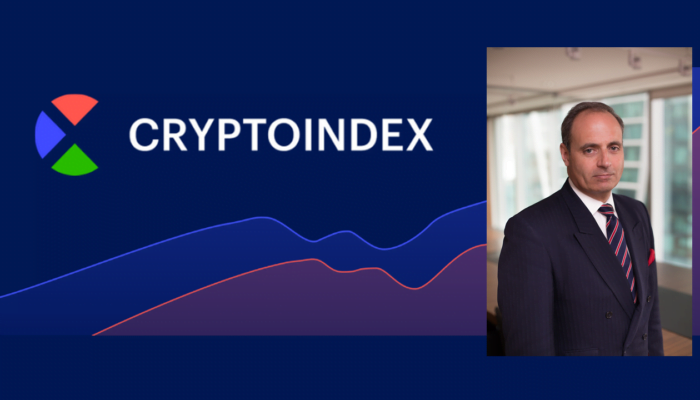 Q: Cryptoindex seems to be on a mission to create an index similar to S&P100, Dow Jones, NASDAQ Composite and more, but in the cryptocurrency industry. How is it going to benefit the market and how do you compare it with the mainstream market indices? A: It is very important for any product that wants to be a part of a financial services solution to provide familiar tools that can be used to evaluate the market. Indices are a key factor in that toolbox. We aren’t necessarily trying to replicate those indices. However, we are looking to provide a similar service relevant to our market sector. It’s important for Crypto to be independent of the old world yet use the lessons learned there. Q: Apart from Cryptoindex, other players are also trying to create their own versions of the crypto-market indices. Is there really a need for it? A: Yes. The market needs to become more professional and more easily understood. Indices are an invaluable source of reference information for people looking to trade or enter the Crypto market in any form. Information and analysis on multiple coins are costly and time-consuming, and Index dramatically reduces both. In the event there is some form of product created to trade that references the index, it further reduces the cost of both trading and analysis, also reducing the risk by diversifying it for the participant. Q: How is Cryptoindex different from other similar products? A: We have a number of differences including the number of coins. By creating an index of 100 coins we have both diversified the risk and added an opportunity for greater profits. Crypto has changed dramatically from an investment into a blockchain based project for a Cryptocurrency and much more into a Fintech crowdfunding opportunity. With so many varied projects available, it is important to include as many as possible that could suddenly become both successful and profitable. Q: You are not new to the financial system. Can you tell us more about yourself, and your work in the past? A: I have spent 34 years in the financial markets usually working on new and innovative ideas and products. 6 Years ago I left the trading floor to start a regulated exchange, launching Index based futures in a new format. That project resulted in partnerships with Deutsche Boerse Eurex, Societe Generale and a number of other major financial institutions. I have now applied the knowledge and lessons learned through that project onto Cryptoindex. Q: What made you create Cryptoindex and where do you think the global financial system is heading, and from where? A: The global financial system is showing all the signs of entering some very difficult times, possibly challenging the turmoil of the financial crisis. While Crypto is going through a difficult period right now, a big shock to the financial system putting the major financial institutions into trouble again could see Crypto as a good store of finances for individuals. Should a major payments provider adopt the ability to pay for goods and services via a card or number of cards, the attraction will become greater. Q: Tell us more about the Zorax Algorithm which is supposed to be the brain of the Cryptoindex system. A: Zorax is a very sophisticated algorithm that can scrape and process vast amounts of data continuously and learn how to interpret the information. Given the parameters it is working on, it can then make well-informed decisions, which in the past, only a human would be able to make. The decisions will eventually become the full process of the index criteria. In the early days as it learns there will be some oversight. Q: Who else is working with you on this project? A: We have a large team of professionals in each of our fields. All of which have a lot of experience in their chosen professions. We have traders from the financial markets, coders and mathematicians with experience in building trading programmes for the FX markets, Quants, and ex-traders from the Fixed Income markets and people with knowledge and experience of creating and deploying financial market indices. Q: The company has started a token sale process with CIX 100 as the nest coin. What will be the role of CIX 100 in all this? A: The CIX 100 is a utility token and our tool to help ICO participants to transition into the more regulated world that is coming fast. The utility of the token is its use to purchase data and services from our platform, some of which are very valuable to observers and participants in the crypto market. We are adding three key factors to the token that are part of the transition. First, when the ICO participant purchases services from the platform, we will value the token at the current market index price. Second, the token will be free to trade on a number of exchanges we are currently in discussions with. We will encourage the token to be relevant to the Index price. Finally, we are partnered with a fund that will, as part of its strategy, offer a purchase facility of the token again at the then current index price. So the CIX100 while still a utility token, we have spent a lot of time and money on getting the right approach and legal opinions on this matter also remains a useful tool to track the index price. Q: How much are you intending to raise with the token sale, and what will the funds be used for? A: We have a soft cap of $3m USD and a hard cap of $$37m USD. The funds will be used for operational expenses however as the platform is already built and nearly ready to launch the majority will be used in reserves to underpin the value of the token to the index through the fund. Q: A project of this scale needs some partners. Have you entered into any partnerships so far and what are its benefits? A: We are in discussions with a number of partners and will make announcements soon, one of the early stage partners is London Derivatives Exchange Limited (LDX). Q: Can you give us a peek into what’s happening behind the scenes, in terms of technical and business development and future roadmap? A: We are exploring a number of aspects including additional indices and adding derivatives based on the various indices. We will continue to develop the various aspects of the business. Q: Anything else you want our readers to know? A: This project is unique in its approach to the development of the ICO/Crypto markets. It will play a vital part in the changing landscape of the way crypto is used and developed in the coming months and years. As the market is brought into the more traditional financial services style of regulation and trading, tools like this will be a key part of helping the wider adoption of cryptocurrencies as an everyday form of finance both retail and professional.